October 24, 1998 – NWA 50th Anniversary Show: Christopher Daniels and Kevin Quinn beat Danny Dominion and Ace Steele. Ace Steel became the Co-Proprietor (with Danny Dominion) of The STEEL DOMAIN wrestling school. ~~~producing such talent as Eric Priest, CM Punk, Colt Cabana, Brad Bradley, and Riki Noga. February 8, 2002 – IWA MS: Ace Steel defeated Dysfunction for the IWA Mid-South Light Heavyweight title. May 3, 2002 – IWA MS: Ace Steel defeated Vic Capri for the IWA Mid-South LHW Title in a 30-Minute “Iron Man” match. Oct-Dec 2003: Ace Steel debuts in Japan on a tour for Pro Wrestling NOAH. January 10, 2004 – ROH: Second City Saints (CM Punk/Colt Cabana/Ace Steel) vs The Prophecy (Daniels/Dan Maff/Whitmere). January 17, 2004 – IWA Mid South Wrestling: Ace Steel won a Battle Royal; Jerry Lynn beat Ace Steel to retain the IWA title! February 23, 2003 – RAW: Matt Hardy defeated Ace Steel (as Chris Guy) in a match taped for Sunday Night Heat! March 13, 2004 – ROH: Colt Cabana and Ace Steele vs Dan Maff and BJ Whitmer went to a DOUBLE DQ! April 24, 2004 – ROH: BJ Whitmer defeated Ace Steel. June 19, 2004 – IWA Mid South: Ace Steel defeated Jimmy Jacobs. July 17, 2004 – ROH: Dan Maff and BJ Whitmer defeated Second City Saint (Colt Cabana and Ace Steel). July 23, 2004 – ROH: Trent Acid defeated Ace Steel and Matt Sydal and Delirious in a 4-WAY. August 10, 2004 – World League Wrestling : Mitsuharu Misawa and Yoshinari Ogawa beat Ace Steel and Jason Bates in 27:31. August 28, 2004 – ROH: Ace Steel (of the Second City Saints) defeated Roderick Strong (of Generation Next) by Submission. September 3, 2004 – Interstate 8 Promotions: C.M. Punk won three-way over Ace Steel and Danny Daniels. September 11, 2004 – ROH: Trent Acid defeated AngelDust, Ace Steel, Kahagas, Fast Eddie and Izzy in a 6-WAY. September 27, 2004 – RAW: Ace Steel appears on RAW as an extra, and gets his hair cut as a part of a demonstration by Eugene. ~~~Ace Steel assumed the name Scott Colton, which was a rib on Colt Cabana, who’s real name is Scott Colton. ~~~On the DVD, one of the announcers commented that it looked like Steel had his hair cut by a mentally challenged person. October 15, 2004 – ROH: Team Steamboat (CM Punk and Ace Steel and Jimmy Jacobs) beat Generation Next (Shelley/Aries/Evans). October 20, 2004 – IWA Mid South: Austin Aries defeated Ace Steel. October 21, 2004 – IWA Mid South: Ace Steel and Chad Collyer defeated Nigel McGuiness and Roderick Strong. October 22, 2004 – IWA Mid South: CM Punk/Ace Steel/M.Sydal/D.Daniels b C.Candido/S.Stone/N.McGuiness/Claudio Castagnoli. November 5, 2004 – ROH: Jimmy Rave w/The Embassy defeated Ace Steele after the Raves Clash finisher. November 6, 2004 – ROH: Second City Saints (CM Punk and Ace Steele) beat Generation Next (Roderick Strong and Austin Aries). March 18, 2005 – New Breed Wrestling Association: Ace Steel participated in the Mike Lockwood Memorial Tournament. ~~~Ace Steel defeated Danny Daniels in the 1st round | Jamie Noble defeated Ace Steel in the 2nd round. May 13, 2005 – ROH: BJ Whitmer and Jimmy Jacobs defeated C.M. Punk and Ace Steel to retain the Tag Team titles. May 14, 2005 – ROH: Matt Sydal defeated Ace Steel and Matt Stryker and Masked Wisconsin Superstar (HC Loc). May 21, 2005 – NWA Central States: Colt Cabana and Ace Steel defeated Michael Strider and Kory Twist. June 5, 2005 – World League Wrestling: Stunning Steve and Ace Steel defeated Wild Bill and Wild Wade. August 12, 2005 – ROH: Ace Steel defeated Matt Stryker and Delirious and Sterling James Keenan in a 4-WAY. August 13, 2005 – ROH: Chad Collyer defeated Ace Steel in a bloody match by Texas Cloverleaf Submission. August 19, 2005 – Gateway Championship Wrestling: Kory Twist won three-way over Ace Steel and Cameron Cage. August 20, 2005 – Gateway Championship Wrestling: Ace Steel defeated Cameron Cage. October 1, 2005 – World League Wrestling: Superstar Steve and Ace Steel defeated Wild Bill and Gary Jackson. November 5, 2005 – ROH: Ace Steel and Delirious defeated Chad Collyer and Nigel McGuiness. January 27, 2006 – ROH: Ace Steel vs Sterling James Keenan ended in a No Contest when CZW invaded ROH. February 4, 2006 – NWA Central States: Delirious and Payday Patterson defeated Michael Strider and Ace Steel..
February 25, 2006 – AAW: Eric Priest defeated Ace Steel. March 25, 2006 – NWA Central States: Ace Steel defeated Mark Sterling by Disqualification. March 27, 2006 – RAW: Lance Cade defeated Ace Steele in a match taped for HEAT. March 31, 2006 – SmackDown! : Orlando Jordan defeated Ace Steel in a match taped for Velocity. March 31, 2006 – ROH: Ace Steel defeated Chad Collyer in a First Blood match. April 1, 2006 – ROH: Jack Evans defeated Ace Steel and Matt Sydal and Jimmy Jacobs and Jake Crist and Dave Crist (6-WAY). June 23, 2006 – ROH: The Briscoe Brothers (Mark and Jay) defeated Colt Cabana and Ace Steel. July 8, 2006 – World League Wrestling: Ace Steel defeated Adam Evans. July 29, 2006 – Ring of Honor: The Embassy (Sal Rinauro and Jimmy Rave) defeated Colt Cabana and Ace Steel. August 11, 2006 – IWA Mid South: Ace Steel defeated Ricky Reyes. September 30, 2006 – Liberty States Wrestling: “Crazy” Ace Steel defeated “Hurricane” John Walters. November 4, 2006 – AAW: Ace Steel defeated Skullkrusher by Disqualification. November 25, 2006 – AAW: Silas Young vs Ace Steel ended in a draw in Berwyn, Illinois. December 8, 2006 – Ring of Honor: Delirious and “Crazy” Ace Steel defeated Adam Pearce and Shane Hagadorn. December 9, 2006 – ROH: Ace Steel defeated Tank Toland (Tank got a “Don’t Come Back!” chant from the fans). December 16, 2006 – AAW: Jimmy Jacobs and Skullcrusher defeated Ace Steel and Silas Young in Berwyn, Illinois. January 8, 2007 – RAW: Ace Steel appeared as a fake Donald Trump for a match against a fake Rosie O’Donnell (Kiley McLean). January 12, 2007 – SmackDown! : The Gymini defeated Sho Funaki and Ace Steel in a dark match. January 18, 2007: Ace Steel signed a developmental contract with WWE and will be assigned to either OVW or DSW. January 20, 2007 – AAW: The Michigan Invasion and Jimmy Jacobs defeated Silas Young and Zach Gowen and Ace Steel. February 22, 2007 – Deep South Wrestling: Keith Walker defeated Ace Steel in a dark match. March 1, 2007 – Deep South Wrestling: Kofi Nahaje Kingston defeated Ace Steel in a dark match. March 8, 2007 – Deep South Wrestling: Ray Gordy defeated Ace Steel in a dark match. September 12, 2007 – OVW TV Tapings: Ace Steel defeated The Belgian Brawler. September 14, 2007 – Ohio Valley Wrestling: Ace Steel defeated Johnny Punch in Hillview, Kentucky. September 15, 2007 – OVW House Show: Ace Steel defeated Kassidy James in Cincinnati, Ohio. September 19, 2007 – OVW TV Tapings: Ace Steel defeated Raul Loco in Louisville, Kentucky. September 26, 2007 – OVW TV Tapings: Ace Steel defeated Scott Cardinal in a dark match. October 3, 2007 – OVW TV Tapings: Vladimir Kozlov defeated Ace Steel. October 5, 2007 – SmackDown! : Chuck Palumbo w/Michelle McCool defeated Ace Steel. October 13, 2007 – Ohio Valley Wrestling: Derrick Neikirk defeated Ace Steel. October 17, 2007 – OVW TV Tapings: Jamin Olivencia and Ace Steel defeated Charles Evans and Justin LaRoche. October 20, 2007 – Ohio Valley Wrestling: Paul Burchill defeated Ace Steele in Elizabethtown, Kentucky. October 27, 2007 – Ohio Valley Wrestling: Matt Sydal defeated Ace Steel in Calhoun, Kentucky. October 31, 2007 – OVW TV Tapings: Matt Sydal and Seth Skyfire vs. Jamin Olivencia and Ace Steel ended in a draw in a dark match. November 7, 2007 – OVW TV Tapings (Airs 11/10): Matt Sydal and Seth Skyfire defeated Ace Steel and Jamin Olivencia (Tournament). December 5, 2007 – OVW TV Tapings (Airs 12/08): Antoni Polaski and Vladimir Kozlov beat Ace Steel and Jamin Olivencia in a dark match. December 8, 2007 – Ohio Valley Wrestling: Ace Steel defeated Johnny Punch (Punch’s 98th consecuetive loss). January 2, 2008 – OVW TV Tapings: Ace Steel and Jamin Olivencia defeated The Insurgency (Ali and Omar Akbar). January 4, 2008 – OVW: Paul Burchill and Stu Sanders beat Ace Steel and Jamin Olivencia to retain the OVW Southern Tag Team titles. January 9, 2008 – OVW TV Tapings: Jamin Olivencia and Ace Steel defeated Andrew Vain and Anthony Bravado. February 4, 2008: Ace Steel was officially released from his World Wrestling Entertainment developmental contract. December 5, 2008 – Ring of Honor: Necro Butcher and Ace Steele defeated The Age of the Fall (Jimmy Jacobs and Delirious). January 31, 2009 – Ring of Honor (PPV): Roderick Strong’s team defeated Sweet and Sour Inc. in a Steel Cage Warfare match. ~~~Roderick Strong’s [babyface] team (Roderick Strong and Erick Stevens and Brent Albright and Ace Steel and Jay Briscoe). ~~~Sweet and Sour Inc. (Adam Pearce and Davey Richards and Eddie Edwards and Tank Toland and Bobby Dempsey w/Larry Sweeney). April 4, 2009 – Ring of Honor: “Classic” Colt Cabana defeated Ace Steel in Houston, Texas. October 22, 2011 – WLW: William Regal defeated Ace Steel. December 1, 2012 – WLW: William Regal defeated Ace Steel. June 14, 2014 – MPW: Jeremy Wyatt defeated Ace Steel. October 12, 2014 – HRW: Vic Capri defeated Ace Steel. December 6, 2014 – MPW: Ace Steel vs. Adam Pearce ended in a double DQ. August 8, 2015 – MPW: Ace Steel defeated ACH to win the Central States title. October 10, 2015 – MPW: Jeremy Wyatt defeated Ace Steel to retain the heavyweight title. December 5, 2015 – MPW: Ace Steel defeated Ricky Morton to retain the Central States title. January 30, 2016 – MPW: Ace Steel defeated The KC Wolves (Graham Bell & Luke Langley) in a handicap match to retain the Central States title. May 7, 2016 – NWA Mid-South: Greg Anthony defeated Ace Steel to retain the National heavyweight title. 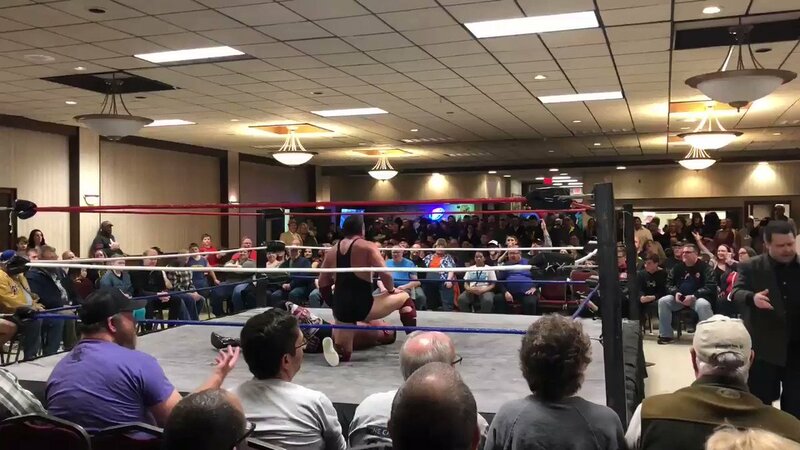 June 4, 2016 – MPW: Ace Steel defeated Steve Fender to win the Kansas heavyweight title and retaining the Central States title. This match was to unify both title as the Central States title. June 11, 2016 – Mid States Wrestling Legends Of Wrestling: Ace Steel defeated The Canadian Red Devil. July 30, 2016 – MPW: Ace Steel defeated Vic Capri to retain the Central States title. September 17, 2016 – SDW: Danny Duggan defeated Ace Steel to win the Northern States title. @Ivdown12 @MKE_Wrestling @StHolmesEsq @DavePrazak @acesofsteel Apparently it’s actually him. The wrestler is his long time friend and trainer. @X_Dahaka_X @MKE_Wrestling @StHolmesEsq @DavePrazak @acesofsteel Aint he super skinny these days? @MKE_Wrestling @StHolmesEsq @DavePrazak @acesofsteel I'd be fine if it was CM Punk, but y'know, imagine the heat on anyone else other than CM Punk?